The interesting thing is that everyone irrespective of your field can and needs to master these skills. For me as a Software Engineer, I use to think that I only needed technical skills, but I was so wrong after I worked for about two years. So I took a course in Project Management and got certified as a Project Management Professional(PMP). Those managerial skills I acquired has helped me a great deal in managing people and situations in the workplaces. Now I still work as a Software Engineer, but I could tell you for sure that people-management skill very much supercedes technical stills. Let’s now examine this five techniques for resolving conflicts. As you examine the scenarios, look for areas you can apply it in you own work environment. This technique involves avoiding any potential situation that may lead to conflict, or assuming for a moment that the conflict doesn’t exist. Or maybe planning to handling the issue at a later time when you are prepared and have the time. In this case, we try to focus on areas of concensus and deemphasize on areas of difference. Here the manager yeilds to the popular opinion if his personal opinion is in conflict. Result: Conflict among the team is resolved. But the may sometimes the organization have to give to make this work. The Compromise/Reconcile techniqe involves looking for options that woul result in some degree of satisfaction to all team members or would partially resolve the conflict. This is similar to the Smooth/Accomodate but with a a little difference. Scenario: A number of employee complain about low quality of PPE(Personal Protective Equipment) which has already been procured. Meanwhile some employees has been issued a higher quality PPE which is currently out of stock. Application: Discuss with the employees with a lower quality PPE, have them fill out a form requesting for new PPEs. Then quickly approve these request and the allow the procurement department to sort out the rest. In this case, on forces his opinion on others using the authorities he have. Scenario: The manager of the IT department decides that every morning, all team member meet by a 8:20 am for a meeting to discuss the day’s activities. An administrator points out that he is normally at the data center at that time for backups/audit. The software automation test engineer object saying he normally runs tests between 8.00 and 8.30 am. Other team members raised objections too. The Deputy Manager does not say a word. How it is can be applied: The manager responds that he would not tolerate exceptions to this rule and he expects 100% compliance irrespective of whatever reasons anyone may give. Result: Temporary solution with unpredictable aftereffects, even posibility of bigger conflicts. Scenario: The Contract Manager meets a software engineer in the IT department and requests that he works with him for two months to develop a data entry form for logging change requests made on site. This request would be a difficult one due to the work load of the Software Engineer in his department being the only Softwar Engineer there. How it can be applied: The Software Engineer recommends that Contracts Manager speaks with the IT Department manager which he does. Meanwhile, the Software Engineer in a mail also informs his manager of ther request from the contracts manager. The IT Department manager calls the Software Engineer and discusses with him asking if he can fulfill the request. He agrees but points out that he can only go for one month. The Contract Manager is invited and the three reaches an agreement that the Software Engineer would work with him for one month at a time. Everyone is satisfied. Result: Lasting resolution to the conflict and commitment from all parties. Although these techniques applies mainly to managers, everyone could learn from the principles in them. 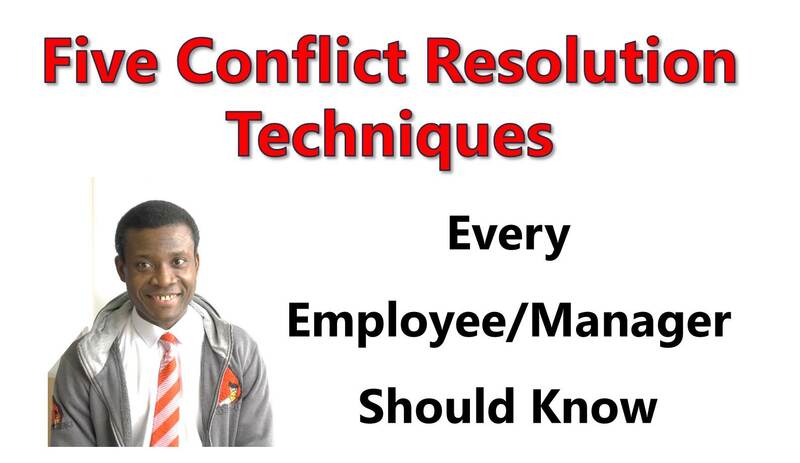 Sadly, some employees/managers does not have knowledge of what to do in times of conflict in the work place. 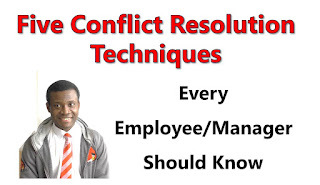 In the next article, we would examine how to manage potential conflicts with colleagues in the workplace.